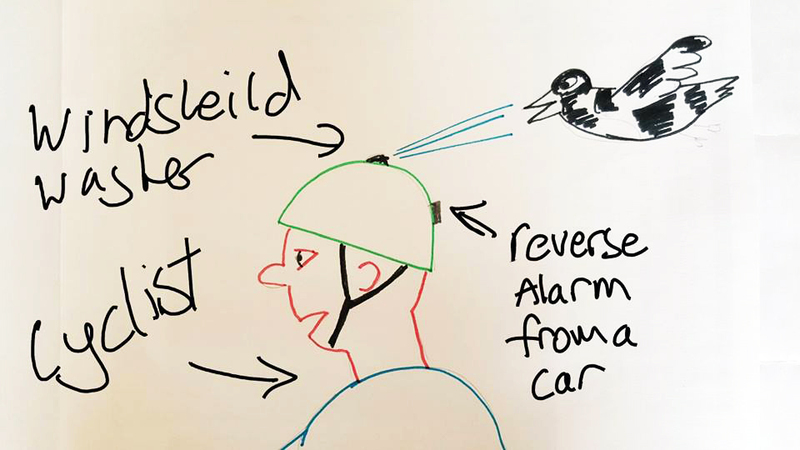 Chris’ Anti-magpie device — Car reversing alarm sensor (to detect things getting close) wired to a windshield washer to deter annoyed magpies. Jeremy’s Sleeviette — Alright fools, picture the scene. You’re out at your favourite brunch bar slamming down some poached eggs. It’s delicious but messy. You’ve got egg all over your face. But that’s OK, you can just use a napkin to wipe your face clean. Oh, only that this brunch bar is too hip and too cool to stock napkins due to their commitment to No ‘N’ November wherein they aren’t allowed to have anything starting with ‘N’ in their premises. Oh sure, but that’s fine. Just reach for the tissues you keep in your pocket for such an occasion only that today you wore your special slim fit jeans that accentuate not only your hips but your vibrant personality. I’m talking so tight that you have to take them off every twenty minutes less your legs atrophy. They are so tight that there’s no way you can even fit one tissue in there. What are you to do? You’re sitting there with no napkins, no tissues, and egg all over your face. And what’s more you have a job interview in 10 minutes so you have to look your best. It seems like what you need is a SLEEVIETTE. 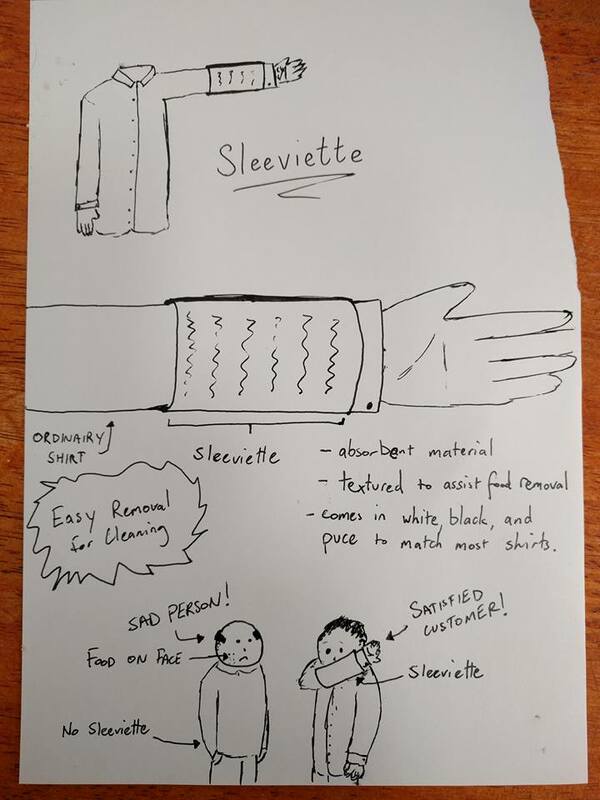 This easy to use product works well with most shirts. You simply slip it onto your sleeve and wear it as a fashion accessory. To use it simply bring it up to the problem area and wipe away. There ribbed structure will capture any loose food particles leaving you to look your best. To clean, simply remove and place it in the wash. The SLEEVIETTE. 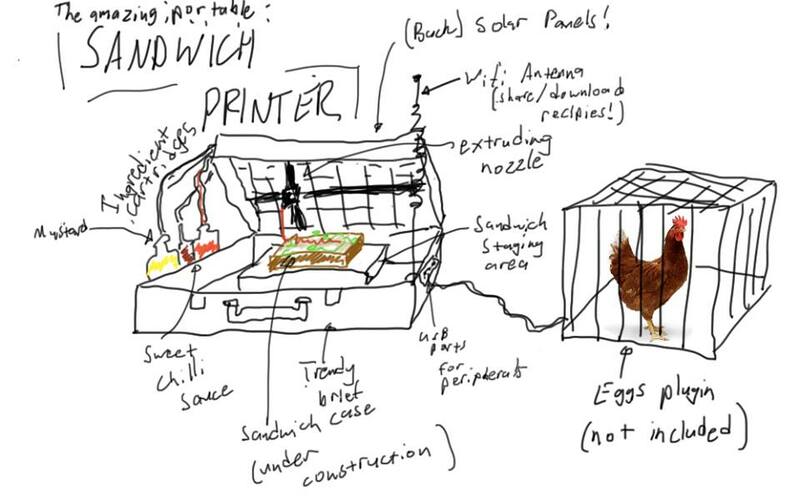 Guaranteed to improve your dining experience and life. 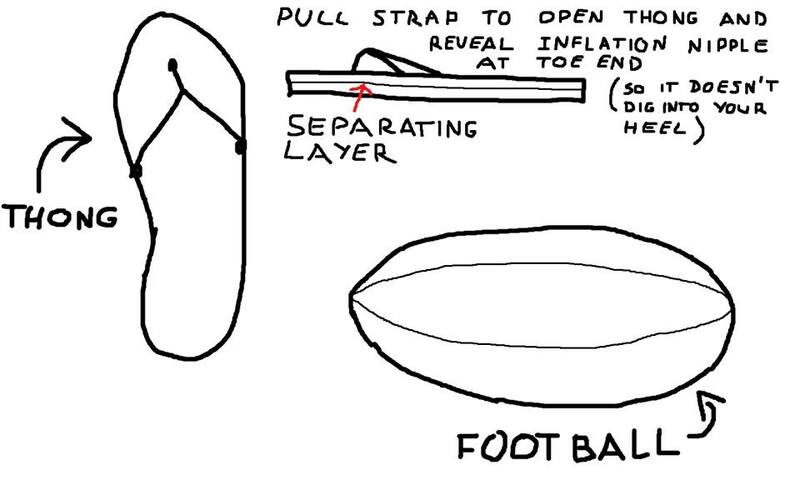 Brodie’s Football Thong — Summer barbecues are saved with the Footy – a thong that inflates into a football! 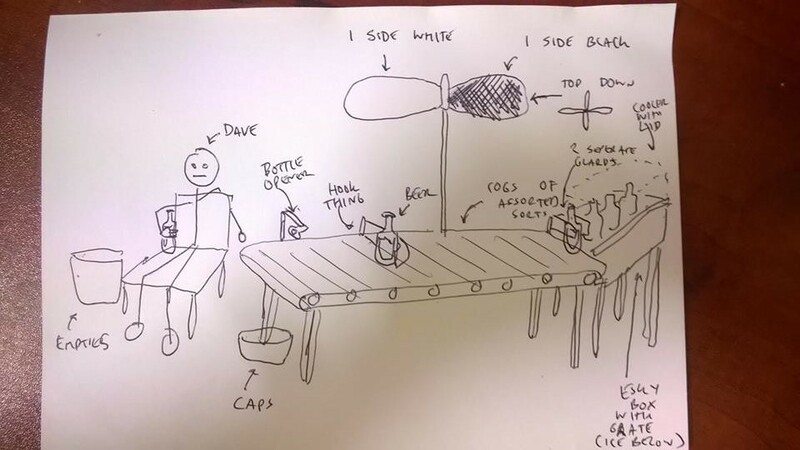 Matthew’s Beer Providerer 3000 — Using a flat blade windmill with alternating sides of black and white, the conveyor speeds up or slows down dependant on the raw now tapped power of the sun. 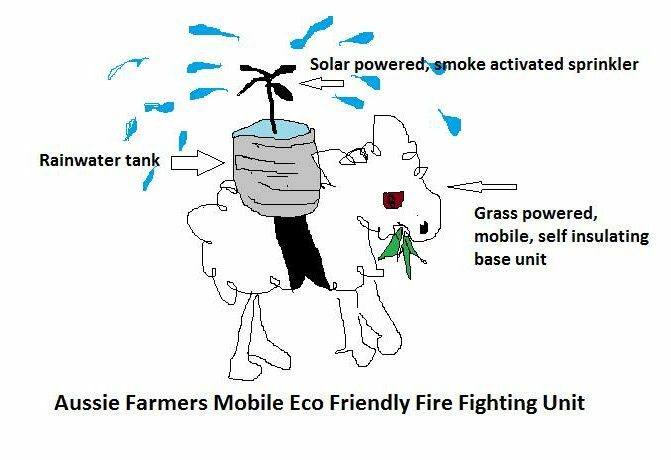 Speeding up / Slowing down depending on the suns raw power to match your drinking speed. A single hook latches and secures a stubbie from the patented slanted cooler box, where approaching the end of the conveyor a solid state cap remover pops the top ready for your waiting hands. 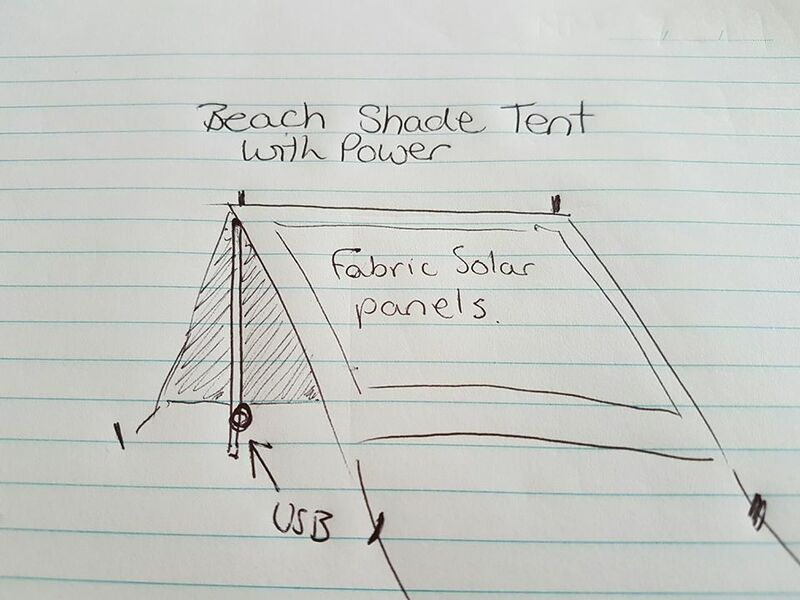 Additional extras include pause button, safety net, ice catcher and parasol for extra comfort. 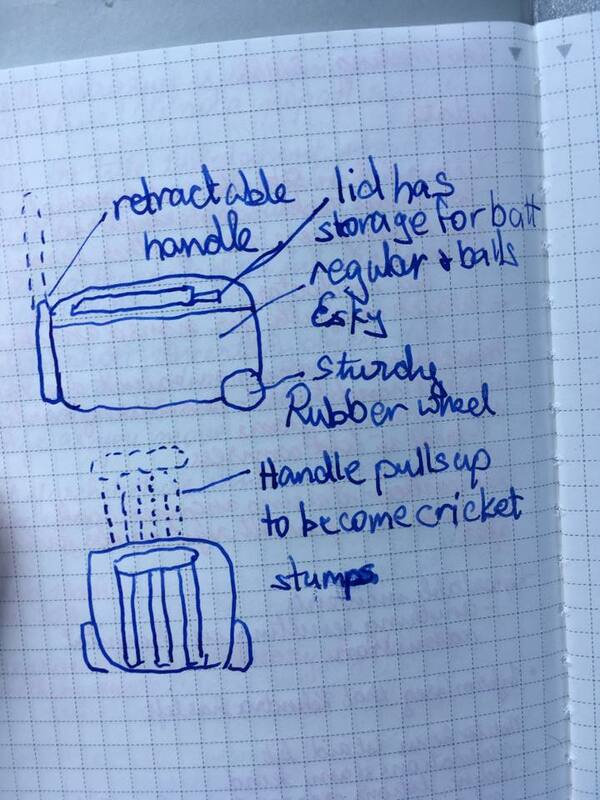 Robyn’s Crickesky — Retractable handle becomes stumps, bat and ball in the lid. Sturdy wide rubber wheels and low friction bearings for easy travel over rough terrain. 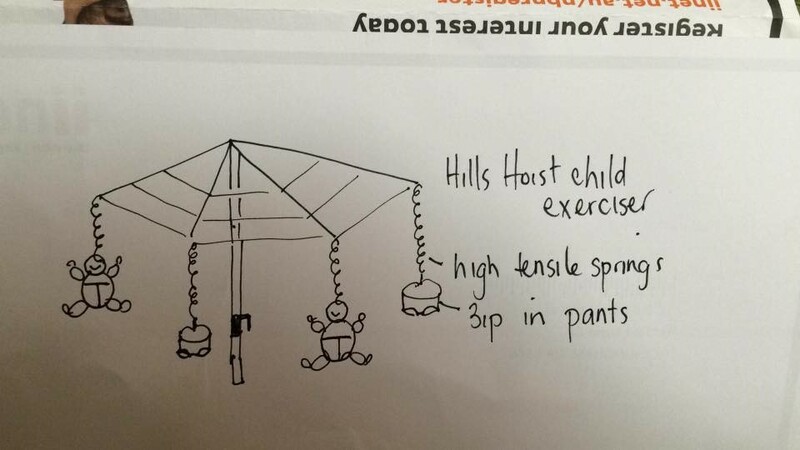 Melinda’s Hills Hoist Child Exercise — My fun exercising idea for overweight or bored children – age restrictions apply of course. 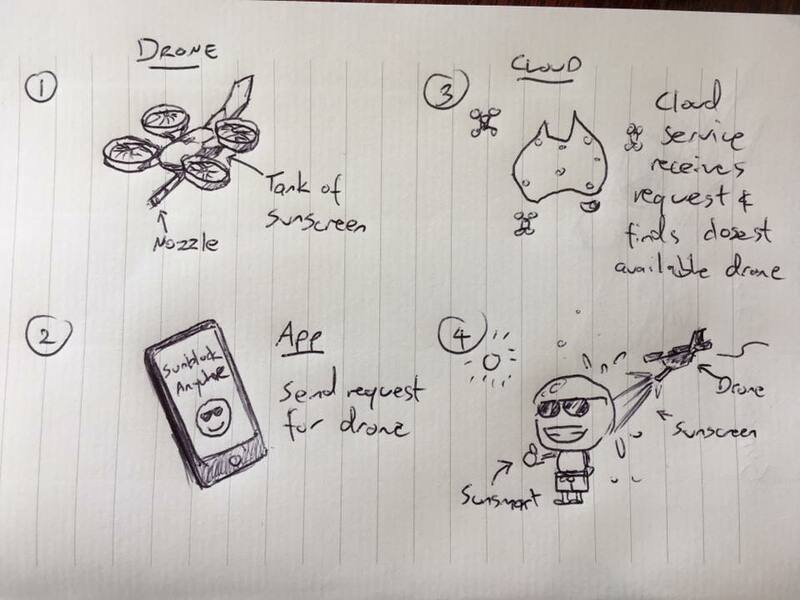 David’s Sunscreen Drone: Request sunscreen from an app and have it delivered by drone! If you were one of the unlucky bunch to miss out on an apron, there’s always our merch store right here.